If Carlsberg made offices, to paraphrase a popular beer commercial, they’d probably look like this. Just off Oxford Street, we’re taking it easy in the headquarters of Seven Decades, the show that brings one of Britain’s best vintage guitar collections to the London stage. There’s a vintage Porsche in the garage at the back, a BMX on the wall and scores of vintage guitars, including a 1958 Gibson Les Paul Standard, stored in battered cases on well-lit shelving. But Seven Decades’ vintage Fenders and Gibsons are not playthings nor museum pieces - it’s a working collection of gigging guitars. Every one of the Seven Decades guitars is played at full tilt through classic Fender and Marshall amps as the show romps through 70 years of the world’s greatest guitar music, from Buddy Holly to Buddy Guy. “We started off just as ‘guitar heads’ - buying one or two things to play - but we started getting obsessed,” says Michael Ross, who is the show’s guitarist and co-founder, along with long-time friend Phil Hylander, who is the hawk-eyed collector on the team. It was Phil’s love of John Frusciante’s guitar playing that drew him to the ’57 Strat that became Seven Decades’ first guitar, which still takes pride of place in the show today. Seven Decades returns to the Clapham Grand on 10-12 October 2017 - tickets are available now from Eventbrite. “We need to have a guitar in our hands and make a connection with it before we’ll buy. 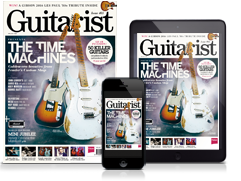 Instinct is massive,” Michael Ross adds, explaining how they choose guitars. The Seven Decades show started out at the famous Wilton’s Music Hall in London, but Phil says the show is set to branch out into other forms in the near future. Phil says that the longer-term project is to produce a more character-driven, theatrical version of the show, though he stresses it will not be a musical. In the near term, they’ll also be working on a shorter, punchier version of the original Wilton’s spectacular - with an evocative new filmic backdrop by rock film-maker Nick Morris and a streamlined set. “So this is the 1957 two-tone,” Michael says. “Still got the original frets on it - they’re hanging in there just about. That was the first vintage guitar we ever bought. “For me, it’s an amazing pairing with the ’58 Tweed, and we use that in the show for Buddy Holly. He played a ’54 and a ’57. But that pairing is great - and we also use it on Buddy Guy tracks. The bridge pickup is a really cool sound. “’54s are real big-sounding guitars, but these have a little bit more of a V-profile neck, a little bit lighter, a little bit more modern. It’s a very transparent tone… really, really clean. Because of that, we also use it for the Gilmour stuff we play. It has a lovely neck… that V-neck is just so playable. “So it’s a really interesting guitar, that one, and it has just the right amount of wear. It’s got a little bit of history: you can see that the neck pickup cover has worn away and that’s likely [a sign of] how someone who owned it once liked to play. “Although when we first got it Phil called me and said, ‘I’ve got my plectrum stuck underneath the cover!’ And I was like, ‘What are you doing? It’s a ’57 Strat [laughs].’ It’s got tons of character and it’s a really good blues guitar. Pickups aren’t too loud, so you’ve really got to manage the tones and volume levels right. “This one’s a ’56 and when we first did a Wilton’s show, we borrowed a friend’s ’55. I really, really enjoyed that guitar,” says Michael. “So we needed a Goldtop - but there was no point buying a ’52 with the trapeze bridge on it, unless you’re gonna convert it. They’re not actually very good guitars, the ’52s, in my view. It’s funny, because people think, ‘Wow, first-year Goldtop, they’re a bargain.’ And yeah, they’re £15,000 less than one of these. But they’re completely different guitars. “We got this about two years ago from a friend who told us it was possibly for sale. That was enough for us to go and check it out, put it through its paces. It has had a refret, but that’s fine - although it’s gonna need new tuners at some point. We can usually repair them, but it’s very delicate up there. It sounds great, and the P-90s are just awesome. I’m a real fan of P-90s. “Actually, we’ve had a lot of people who’ve seen the show say this is the nicest-sounding guitar in the show. We play Guitar Slim stuff on that, because he was an early Goldtop player and, again, had a little tweed, and so we do him, and Rosetta Tharpe who played a Goldtop and, of course, Freddie King, who was an early Goldtop player. All the players who bought them because they were gold and they were flash, and it showed the world that they’d done good. “We bought this ’Burst about two years ago. We wanted to give ourselves enough time to find a particular kind of ’58 and it’s obviously not something you walk into lightly. “But, eventually, the right one came up and it was a case of doing our homework and spending time playing it before we pulled the trigger,” Michael recalls. “I think it’s particularly complicated with a ’Burst,” Phil interjects. “Because if you think about a sunburst Strat, it doesn’t matter whether they’re really beaten up. But there is a different level of tolerable wear on a ’Burst, I think, before it doesn’t look right. “When we played it, we hooked it up to a little tweed amp,” adds Michael. “And it was like, ‘Yeah, this is really good.’ It’s quite a mellow ’Burst, which again is quite nice because they’re all different. You can sit there and be like, ‘Oh, which one’s better?’ but really that’s not what it’s about. They’re all so different. But ’58s, I think, are very generally a bit mellower; I tend to think of a ’59 as being much more potent. “It came up that we needed something different to the 50s tweed [Super], because that amp breaks up quite fast: the break on it is much more intense. So we got this Vibroverb. “Again, it has two 10-inch speakers. Nice and punchy - I’m a fan of the 10-inch speakers. I’m a massive fan of Deluxe Reverbs as well, although, weirdly, I found I preferred the reissues to the original ones. We had a few. So what were looking for was something similar to a Deluxe Reverb, but something that wouldn’t break as quickly. Something with a bit more oomph to it. And I didn’t want a Twin. Because I just didn’t want to lift the bloody thing! “With the Tele, there’s a bit of an Andy Summers story behind that,” Michael continues. “We were looking to purchase a Tele to play So Lonely on. We’ve got a lovely ’52, but we actually wanted to get something a bit different on the Tele front, you know? So we went and bought the ’63 Custom. It’s hot as hell. Those pickups need to be dipped [wax-potted] big-time, but you just can’t do that with an original guitar like this. You just have to control it - I always have to watch it on stage. “This is an early ’69 Black Beauty. I’ve always liked ’68 and early ’69 Black Beauties, and it’s pretty hard to find a clean one,” says Michael. “It’s got a really fast, slim neck and it’s a lot of guitar, I think. If you think that Gibson are doing a Collector’s Choice ’68 reissue for about nine grand now, it’s about what we paid for that. So we were on the lookout for one, because we had the Goldtop and the ’Burst and we wanted a Black Beauty, but we didn’t want a 50s one - too expensive - and so this one came from Chicago Music Exchange. “Phil saw it on their website and said, ‘It looks really clean,’ so I called Angelo who runs it and he got the staff there to put it through its paces: play it, check it out… And so he personally saw the deal through. “In fact, this is about the only guitar we didn’t play ourselves before we bought it. They’re so hard to find in clean condition. But it is a great Les Paul and for the money, those guitars are amazing value. For more on information and upcoming shows, see the Seven Decades website.